1 . Any arguments that happened as a result of me bringing up something he had done or said were always flipped to be my fault and I would end up crying and apologising and he would withhold affection. 3. Twist words, made me feel that it was my fault, would be over the top flattering then create a false sense of trust then use information to put me down. Would make me feel anxious, never knowing when he’d turn up, would ask me to do things, but if I refused, was made to feel stupid. Emotional distressing. 4. Control food in the house, what I would be allowed to eat. Made me go to the gym with him every day. I got too thin but he liked me that way. He made all the terms in the relationship. Would triangulate me with old girlfriends and young pretty girls telling me I’m jealous and insecure. 5. Immediately after asking a question, he would bombard me with more and take the conversation in a different direction. Then he would point out my “flaws” and say we needed to “work on” my “development and growth.” He avoided answering questions by humiliating me for asking them. 6. Did not like to go out or travel, I was not allowed to do anything without his permission. He would dismiss all my opinions and treat me like I was self centered and selfish. Especially if I tried to stand up to him. 7. Verbally abusive, temper tantrums. Silent treatment when he did not get his way. Cursed and yelled a lot. 8. He would never answer a question. He would keep information from me about his schedule/trips. He would tell his son to ignore me. He would lie. He would take my things and when I asked him if he had seen them he said no. Then my things would be back in their place and he’d tell me I was crazy and suffered from mental health problems. 10. Made me feel that if I didn’t look, behave, act like he wanted, others would think less of me. He was a loner, only wanted to be with me. I thought it was because I was special to him. It was because he was distancing me from everyone else – removing my support. 11. Always had an answer for everything. It was never his fault; he would always manage to twist everything. Would make you feel you are the guilty one even when you aren’t. 12. Intermittent reinforcement, gaslighting, stonewalling, smear campaign, goading, lies upon lies, belittling, humiliating, ghosting (not answering texts, emails, calls), missing important appointments, the list goes on…. Examples like these will be part of my next book, Senior Sociopaths — How to Recognize and Escape Lifelong Abusers. 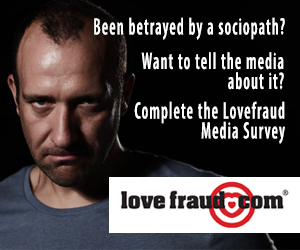 More than 2,000 Lovefraud readers completed the initial senior sociopath survey, providing a wealth of information about their experiences with sociopaths over the age of 50. A total of 512 respondents described romantic relationships with people who were already over 50 when they met and turned out to be disordered. Ninety-one percent of the respondents said they endured emotional abuse, and 84% were psychologically abused. 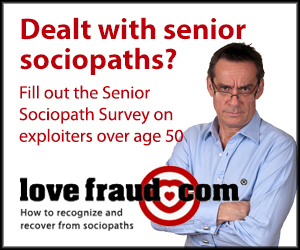 I’m still collecting data on dealing with senior sociopaths. If you have tips or advice for others on coping, escape or recovery, please complete the survey. Click the link below. All of these sound terrible. I’m wondering why these people did not leave sooner, if it were economically feasible. I’m a victim too, but I fight back. Many of these things sound like things my mother did, when I did not have the luxury of picking up and leaving (I did once I turned 18). I fight back and adopt the same tone. I also had a stroke when the stress was bad and my husband behaved as if I’d done it on purpose to annoy him. I’ve been in recovery for 18 months and have had two replacement knees and this has meant lots of exhaustion. He never believes me ever even over minor things. My difficulty has been Financial and I’m trying todisentangle right now. 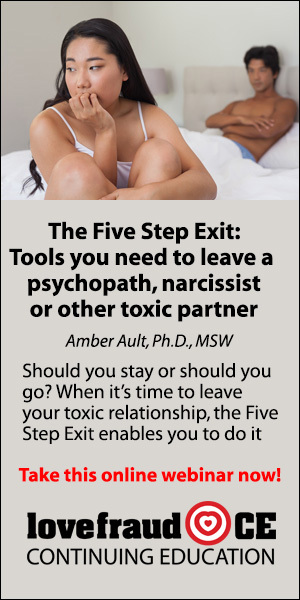 Leaving is sometimes not an option, especially if the abuser holds the purse strings. 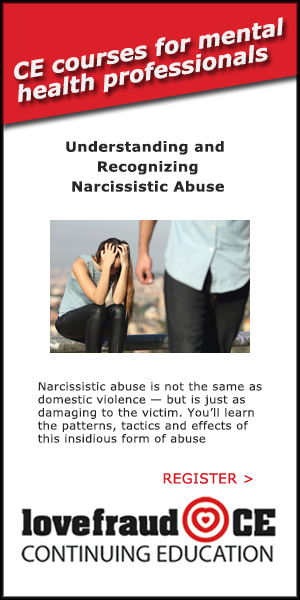 Sometimes it is emotionally impossible to leave — these abusers are good at making the abused believe it is her fault, that she would never make it without him, that she is useless. Sometimes the abuser has so much time and energy invested she wants to make it work. In my case I believed the abject, emotional apologies and begging for forgiveness that always followed a tirade, and I hoped beyond hope this would be the last time. Until I stopped believing. Then I left. Infinity, it is common that women don’t understand what is going on with these men, and try to work on the relationship, and that is why they don’t leave. We have only been around normal people, so try to deal with the psychopath as if he is a normal person, which is futile. 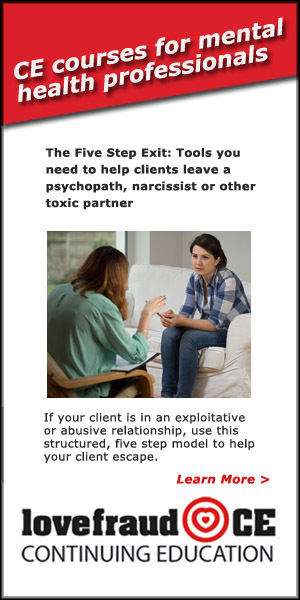 Also, they manipulate you so quickly and so totally that you are hooked and just keep trying, not realizing the abuse until you find a site like this for help and it explains everything – it is NOT clear what is going on when you are in it. We are normal, empathetic human beings and have been manipulated into thinking we love and are loved and react normally trying to make the relationship work. In my case and many others, fighting back only results in them tightening the screws – reminding you that you are so flawed and they are “helping” you, and always that if you don’t “behave”, there are many women waiting in the bushes (an exact quote from my relationship) to take your place. Their techniques of love bombing from minute one work to keep you hooked, brainwashed and walking on eggs. In my own case (a college educated, financially independent professional woman), my ex had preyed on my sympathy from the beginning (all the prior women were crazy, etc.) and had me convinced that being able to stand strong and stay with him in spite of him being batshit crazy and abusive made me a better and stronger person than those other women were. I realized none of this until after he discarded me for the final time and I discovered this site and others and became educated. Even having a passing conversation with these monsters is dangerous to the normal person if they want to target you, they are like a deadly airborne virus that can infect you with the most innocent exchange. 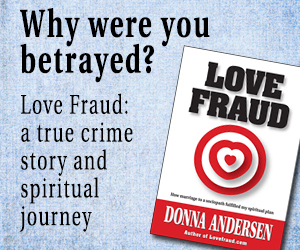 when I was married to my abuser, for so long; I often bought Christian books about love and marriage. They all, with a few exceptions, promote the ‘submissive wife’ scriptures found in the Bible..these are NO help at all, in a relationship with a psychopathic man. I had to ‘abandon’ the Christian books and look for ‘worldly’ books which are much more moderate about marriage/divorce. I didnt feel so guilty towards God, if I had to divorce to save myself, and I did. Many don’t leave because they simply had no idea that a very dark secret life that existed, dating back to long before they met their Sociopath was occurring . I don’t ask myself “why didn’t I know” any longer. We only know what they want us to know. 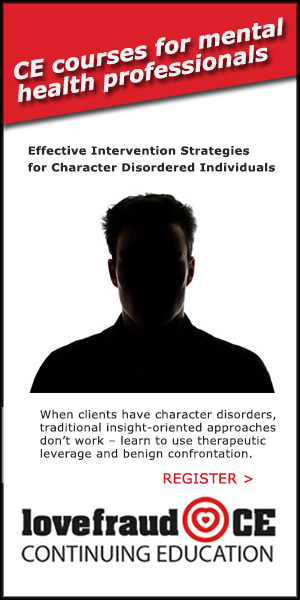 Depending on whether you’re a primary supply source or secondary supply source the treatment by the sociopath can widely differ. A secondary supply source will not be openly devalued unless/until by chance someone that they may benefit more from. If you’re meeting the specific needs that we’re required for the position of “Secondary Supply Source…they aren’t looking to discard you. It’s actually the opposite and can become quite frightening since losing you not an option to them. 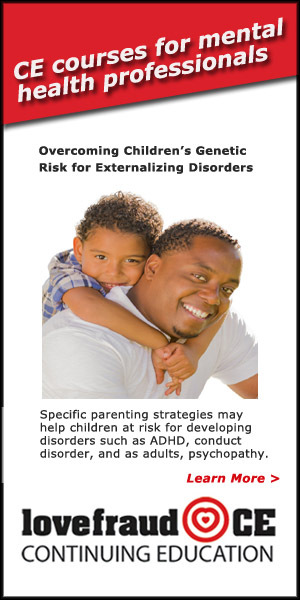 Many are also Diagnosed with Disaccociative Identity Disorder. You, like everyone else only sees “the false self”..charmer, nice guy, mimics emotions of love,sorrow, empathy, etc. It could be 30 years later when you find out by accident one little thing…maybe an affair and you’re begged to go to couples therapy. And the story grows and grows and goes back 40+ years…lomg before you ever knew this person. As the story is growing, the Sociopath is getting caught by you and the couples therapist in weekly lies until he’s tangled in his own web. The Sociopaths ‘true self” is very, very different from the husband you knew prior to accidentally finding out that one thing and since I wouldn’t “let the dust settle” and nowwas living with his unbidden “ true self” I was living with a man I didn’t know. A man who had never raised his voice at me would go into the most insane rages that I had never witnessed in anyone, in a split second, ongoing stalking, gaslighting tothe point I hid a recorder in my pocket. The next time he said, “I never said that. Your delusional.your mind is playing tricks on you and you need psychiatric help”…I pulled the tape recorder out, he grabbed it and smashed it against the wall. I’ll also add that when this occurred there was no sign of my husband( false self) and was only seeing his “true identity” he didn’t even physically resemble my husband. Voice changed, facial features changed, eyes, that I always thought were so beautiful tool on a look of empty and hollow. I never saw my husband again , made 2 attempts to divorce that he contested. I was finally successful the third time only because he did something crazy and wound up in jail. If I’ve seen him in public because by chance we were in the same place…I see my husband only because he’s in a public venue and in public people will only see his false self …Mr. Nice Guy. Point is I lived 27 years being terribly abused yet had no idea . It wasn’t until that day I found out one thing that opened up the Pandora’s Box of a Sociopaths ver dark secret life. There’s no contact since I divorced him 4 years ago. He’s blocked everywhere. I was warned by psychologists that the abuse would continue . It has. He creates new email accounts to get through. He creates fake Facebook accounts to send messages. I moved 1 year ago and took many precautions to insure he wouldn’t know where I was. Got a PO Box, changed my landline and cell phone number so he wouldn’t be able to trace me. Last January I got an email from him . One line…my address. 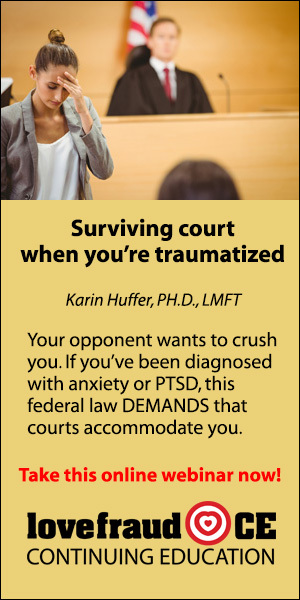 He created “contact” by utilizing the courtroom as his venue to continue to abuse me, having me served 23 times since 2015 on fabricated contempt charges. I disprove his charges but he’s never been sanctioned. Without consequences he’s allowed to continue. Hisnewest complaint for contempt I was just served is actually something he charged me with in 2015. I found the judges orders in my files, and last night I wrote my answer to the complaint. Then I reasearched and googled for hours. I was told by a psychologist years ago that to survive this I needed to educate myself and not to stop. Educating yourself empowers you. I came across Ma. Rule 11. I located the right Court Motion Form and requested sanction on him for filing frivolous cases with no merit for the intentional purpose of harassing , wasting the courts time, wasting my lawyers time and increasing the cost of my legal fees with the intent to render me indigent. I already know the judges tend not to write sanctions of that nature even though it’s federal law . But, just it being on file is a good thing. But , I pull myself as together as I can and go on. I can never count on him standing beside me or supporting me in hard times. I begged him once to stay with me when I had to give evidence about suspected child abuse.. Although he loves the kids he is full of self pity because of me and how I treat him and is sentimental about the past now they have grown. Thanks to Donna and this website I am now able to identify abusers/sociopaths very quickly. When I’m dating and I see a couple of things from the above list …. it’s over!!!!! 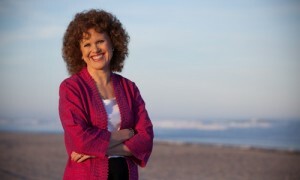 Every woman who is dating should immerse herself in Donna’s site and material!!!!!!! Like you, I am immersing myself on this website, and I notice that sociopaths pick up “I’m onto them,” and RUN! Half my brothers I have no contact, one very occasional e-mails, and another, only or medical emergencies (since I’m disabled), and for the major holidays to prevent abuse of his wife and grandchildren, at least for the holidays. They all know I call them on it! people usually ask ‘why dont (didnt) you leave? you dont know, until you’ve been in a situation like this, that lasts a LONG time, what it’s like. There was NO crisis center/hotline,safe place back when when I was married, before the kids came along. 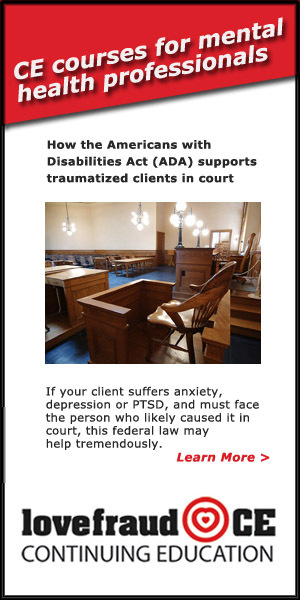 By the time, an area crisis center/hotline WAS established, I had 3 kids under the age of 5. A custody/child support battle with him, would have destroyed me. I had NO courage to fight back,even before then. I believed everything he said and did, was MY FAULT..it took years of emotional/verbal abuse, physical overwork (on our farm), and I ‘hit bottom’..to realize I HAD to leave, or he would have completed the job of me being dead. I barely had enough left inside me, TO LEAVE. And if you cant afford, or drive easily to counseling..you cant do it. I had NO higher educatin than HS, so I had to find work to support myself. He turned the boys against me, so i am estranged by them as well. I found books/articles about psychopaths and I know (now) what I WAS dealing with then. I often DID fight back, and paid prices for my defiances of HIS authority as the male in the house. I have not dated since my divorce in 2000. Grew up with this kind of abuse, (my brothers), so I thought it was normal. Sadly, they grew up to abuse their wives and children. What can be learned from this? If your date mistreats his mother and sisters (also father and brothers), don’t make excuses for his behavior or him. This also goes for a man who is cruel to waitstaff, clerks and cashiers. 3 really important principles I learned on this site. 2, Growing up in toxic family left me brainwashed about the entitlement of others. It wasn’t even about self esteem for me, rather it was confusion. I had no idea what normal would look like. 3. I have learned that the longer the toxicity goes on the more damage is done. I did leave my toxic family when I was able to be financially solvent but they still did everything they could to ruin that & I have been homeless a couple of times. I may have gotten away but it was never “over” from their viewpoint. Thank you all for adding your comments. I wonder if there is some type of addiction going on, if we get “addicted” to our abuser. 2. Sociopaths seem to like to threaten to leave. I think they do that to appear more valuable. 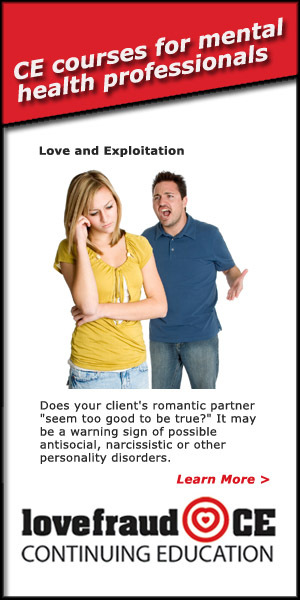 I’ve had this happen totally outside of relationships (in business). Unbeknownst to most of these antagonists, they were not wanted on the first place! (and should they realize, they merely up the ante). This shows they are doing this to Everyone, not just us. I guess they have to prove their value in that sick way. I think the term “intermittent reinforcement” applies here. Perhaps the trick to leaving these situations is to let go of the addiction. Infinity – yes, the relationships are addictive. And the sociopaths threatening to leave is one of the ways that they reinforce the addiction. 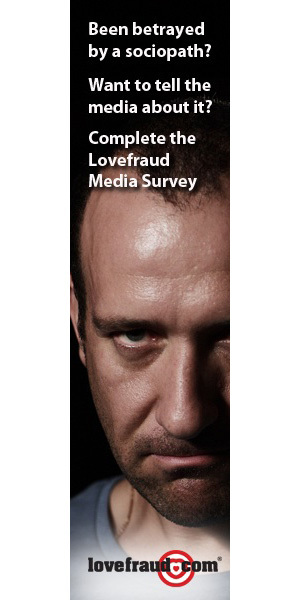 We’ve written about this a lot on Lovefraud. Type “addicted to a sociopath” in the Google search box at the top of this column and you’ll see the articles.